The Ponies’ lacrosse team followed a big win with a disappointing loss. 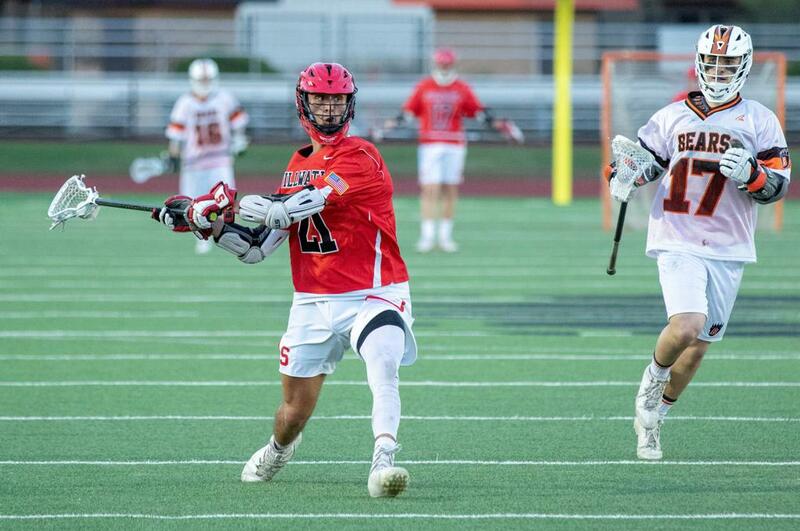 Facing a pair of rivals ranked in the top 10 brought both elation and deflation for the Stillwater boys’ lacrosse team last week. But the Ponies, who have state tournament aspirations, understood the value in both lessons. Stillwater opened the week Monday with a 13-2 victory against White Bear Lake, ending a seven-game losing streak against the Bears. Two nights later, however, the Ponies fell 16-8 to Mahtomedi. Since 2010, the Zephyrs have won 11 consecutive games against Stillwater, including three playoff meetings in the past four seasons. “They’ve always had our number,” senior Mason Green said. The latest loss hurt a little more. Stillwater entered the week 5-0 and ranked No. 10 when it crushed No. 7 White Bear Lake. A home game against No. 5 Mahtomedi provided a chance to further validate the Ponies’ legitimacy. With the score tied 1-1 about two minutes into the game, each team went in different directions. Mahtomedi scored seven consecutive goals and led 8-2 at halftime. Stillwater, which had defeated five of its six previous opponents by 10 or more goals, didn’t know how to respond. Stillwater’s attack is fueled by Tommy McGuire (25 goals), Blake Evensen (16), Nelson Summary (14), Tyler Thureson (12) and Green (11). Their pressure overwhelmed Lakeville South and Cretin-Derham Hall by a combined score of 33-8 as the Ponies started the season 2-0. “After beating Cretin-Derham Hall, we said, ‘Hey guys, we can bring the heat,’ ” Green said. In goal, senior Luke VandenBergh is a big factor in the Ponies allowing more than six goals in only one game. Sophomores making large contributions include Summary, Thureson, midfielder Joe Stengl and faceoff specialist Riley McDonough. Green, McGuire and midfielder Noah Ness, the senior captains, must steer the team through the adversity brought by the Mahtomedi loss. Showing some second-half spark against Mahtomedi, Stillwater cut its deficit to 10-5 on goals from Evensen and McGuire. But six consecutive Zephyrs goals decided the outcome. Afterward, Stillwater’s captains spoke of an emotional vacuum created by the rousing White Bear Lake victory. Upcoming games against traditional powers Eden Prairie and Orono provide the Ponies more chances to gauge their resolve. Win or lose, players are grateful for a challenging schedule as they aim at a first state tournament trip. “Sure, it’s fun to pump teams, but I think every team needs a low like this, a setback to realize that we need to come into every game ready to work and bring that energy,” McGuire said. Tyler Winship and Collin Schulz combined for seven second-half goals to power the Panthers' comeback victory. Since Aron Lipkin came out publicly last fall, he’s found mostly support and also a new awareness of derogatory behavior that can permeate the sports culture. The Redhawks won their season opener against their Independent Metro Athletic Conference rivals with seven combined goals from Claire Nelson and Grace Nickoloff. The Skippers erased a 3-1 Lakers' lead early in the second quarter and never looked back. April 18: The Ponies enter with revenge on their minds after a heartbreaking loss to the Zephyrs in the section final in 2018.